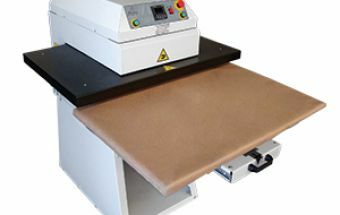 The PTS 1200- HEAT PRESS has been developed for applying special effects, prints, and other applications to clothes like Jeanswear on an industrial scale. Being easy to operate, this is a semi-automatic model with an application tray measuring 650x1200mm. This model is designed with the front opening drawer system, allowing to dress a piece of garment over the lower tray without contact with the thermal platen, thus assuring more agility and safety to the operator. The upper heating platen features double Teflon coating, casted-in heating resistance and milled in aluminum to provide a uniplaten pressure over the entire platen area.